A long non-coding RNA molecule called cherub is a driver of tumor development. How healthy cells become tumors is a question that has interested scientists for decades. Many tumors exhibit genomic instability – that is, increased numbers of DNA mutations and chromosomal rearrangements. However, some tumors – including most childhood cancers – have few mutations and are thought to be driven by mechanisms other than genomic instability (Lee et al., 2012). Important cancer research in flies has been carried out using neural stem cells called neuroblasts. Normally, a type of neuroblast called a Type II neuroblast divides asymmetrically to form a new neuroblast and a slightly more specialized cell type called an intermediate neural progenitor cell (INP); the new neuroblast is able to repeat this process several times. In parallel, the INP continues to divide to produce a new INP and a neuronal precursor cell in each round (Bello et al., 2008; Boone and Doe, 2008; Bowman et al., 2008, Figure 1A). The neuronal precursor then divides to generate mature neurons. When a tumor suppressor gene called brat is blocked, INPs transform back into tumor neuroblasts that divide indefinitely (Lee et al., 2006). So far, the mechanisms involved have remained unclear. Misregulation of cherub RNA causes tumor growth. Neurons develop from neural stem cells called neuroblasts and specialized cells called intermediate neural progenitor (INP) cells. Landskron et al. found that a long non-coding RNA (lncRNA) named cherub has a role in the development of brain tumors. (A) In healthy flies, the protein Staufen (yellow half circle) anchors cherub (red half circle) to the basal part of the neuroblast cell membrane. After the neuroblast divides, cherub is inherited in the INP cell and spreads within it. As neuroblasts mature, they start to produce the protein Syncrip (Syp: green), which reduces the levels of a protein called Imp (blue). (B) In flies that lack the tumor suppressor gene brat, cherub remains at the cell membrane of the INP cells. When Syp is expressed as the neuroblast ages, it also remains anchored to cell membrane of the neuroblast by cherub and Staufen. This prevents Syp from repressing Imp, and some of the INP cells develop into tumor neuroblasts. (C) In flies that lack brat and cherub, cherub can no longer tether Syp; this allows Syp to inhibit Imp, and the neuroblasts are able to mature. Now, in eLife, Jürgen Knoblich and colleagues at the IMBA in Vienna and the University of Basel – including Lisa Landskron as first author – report that genomic instability is not a driver of neuroblast tumors (Landskron et al., 2018). Landskron et al. compared healthy flies and flies in which the brat gene had been mutated and showed that both groups of flies had the same number of chromosomes. Moreover, they found no additional DNA mutations responsible for tumor development. However, further analyzes revealed that the tumor cells had increased levels of a previously uncharacterized long non-coding RNA: this is a molecule that is transcribed from DNA but is not usually translated into protein. Landskron et al. found that this specific long non-coding RNA, which they named cherub, was not required for normal development, as mutant flies lacking cherub were healthy and fertile. However, flies with a defect in both the brat gene and the cherub gene had smaller tumors, which suggests that cherub is required for tumor progression. While other long non-coding RNAs have been implicated in tumor growth, cherub is the first to be discovered that is not uniformly distributed throughout the cell. Rather, cherub is located at the basal end of the neuroblast cell membrane. 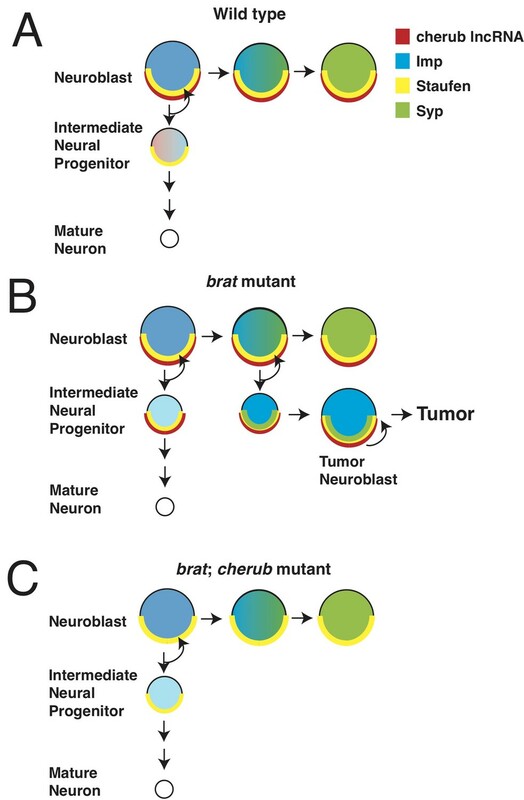 When healthy neuroblasts divide, cherub is distributed into the INP, which forms on the basal side of the neuroblast, and then diffuses throughout the cell. Thus, with each round of division, cherub levels slowly decrease in the INP (Figure 1A). In brat mutants, however, cherub remains at the cell membrane in both the neuroblast and in the INP. This faulty localization prevents the dilution of cherub and causes the INP to transform back into a tumor neuroblast (Figure 1B). Why does the incorrect localization of cherub cause tumor growth? In fly neuroblasts, the proteins Imp and Syncrip regulate neuroblast aging (Ren et al., 2017). Normally, these two proteins inhibit each other: Syncrip levels increase as the neuroblasts age, while Imp levels decrease. Both the expression of Syncrip and the absence of Imp are required for neuroblasts to stop dividing (Yang et al., 2017, Figure 1A). Landskron et al. showed that in flies lacking brat, Syncrip and cherub are inappropriately localized at the tumor neuroblast cell membrane. Moreover, Syncrip and Imp are both expressed. This is presumably because newly-produced Syncrip remains tethered to cherub at the cell membrane, where it is unable to reduce Imp levels (Figure 1B). Thus, the tumors continually produce Imp and do not age. When cherub is not present, Syncrip remains distributed throughout the cell. This reduces the levels of Imp which, in turn, slows the growth of any tumor and improves the life expectancy of brat mutant flies (Figure 1C). How does cherub localize to the cell membrane? The experiments revealed that cherub binds to another protein called Staufen, which attaches to the asymmetric cell division machinery, and thus tethers both cherub and Syncrip to the cell membrane. This work reinforces the notion that changes to the proteins that regulate asymmetric cell division and cell fate can drive tumor formation. Previous research has shown that Imp levels are also dependent on another protein called Chinmo, and that overexpression of Chinmo causes tumor growth by maintaining inappropriately high Imp levels during the window when Imp is normally expressed (Narbonne-Reveau et al., 2016). Thus, preventing stem cells from maturing and aging appears to fuel tumor development. This study also highlights the importance of long non-coding RNAs in stem cell development and in tumor formation. While it has been shown that other long non-coding RNAs are involved in stem cell development, this may be one of the first examples where changing the localization of such molecules prevents stem cells from aging, thus driving tumor growth (Guttman et al., 2011). It will be interesting to see whether other long non-coding RNAs use the same mechanisms to drive tumorigenesis. Journal of Clinical Investigation 122:2983–2988. © 2018, Malin et al. Tumor cells display features that are not found in healthy cells. How they become immortal and how their specific features can be exploited to combat tumorigenesis are key questions in tumor biology. Here we describe the long non-coding RNA cherub that is critically required for the development of brain tumors in Drosophila but is dispensable for normal development. In mitotic Drosophila neural stem cells, cherub localizes to the cell periphery and segregates into the differentiating daughter cell. During tumorigenesis, de-differentiation of cherub-high cells leads to the formation of tumorigenic stem cells that accumulate abnormally high cherub levels. We show that cherub establishes a molecular link between the RNA-binding proteins Staufen and Syncrip. As Syncrip is part of the molecular machinery specifying temporal identity in neural stem cells, we propose that tumor cells proliferate indefinitely, because cherub accumulation no longer allows them to complete their temporal neurogenesis program.